Does the thought of not venturing on an ocean cruise because of the fear of being sea sick prevent your client from enjoying the holiday of a lifetime? Sea-sickness on boat travel is probably the reason why they think they will have the same reaction on a cruise, however this is not necessarily so and few people actually feel sick on a large cruise ship. However if your client has it in their mind that they are going to suffer from sea-sickness then they will probably seek your help in overcoming this. 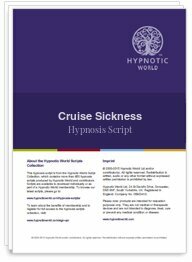 This Cruise Ship Sea-sickness hypnosis session will help to alleviate your client's fears so that they can at last book that holiday and enjoy every minute of it.